Michael James on Money: Should You Delay Taking CPP and OAS? Should You Delay Taking CPP and OAS? The default age to start collecting Canada Pension Plan (CPP) payments is 65. However, you can start anywhere from age 60 to 70. Less well known is that you can delay collecting Old Age Security (OAS) payments until age 70 as well. There are incentives for delaying these payments, and it’s not easy to decide whether to take lower payments early or wait for larger payments. Here I do an analysis that helped me make up my mind. Let’s start with OAS because it’s simpler. The default starting age is 65. However, your payments increase by 0.6% for each month you delay starting to take OAS before age 70. So, if you wait until age 70, you’ll get $1.36 for every dollar you would have received when starting at 65. It’s important to understand that these amounts are indexed to inflation. Some people mistakenly believe that someone starting to collect at age 65 would have his payments catch up to the amounts received by someone taking OAS at age 70. This is not true. $700 x 1.36 = $952 per month. For the rest of their lives, Carol will always get 36% larger payments than Alice will get. This compensates Carol for receiving nothing for 5 years. If we ignore income taxes for the moment, we can calculate the return Carol gets on her “investment” of 5 unpaid years. This return depends on how long Carol lives. The longer she collects the larger payments, the better her investment looks. 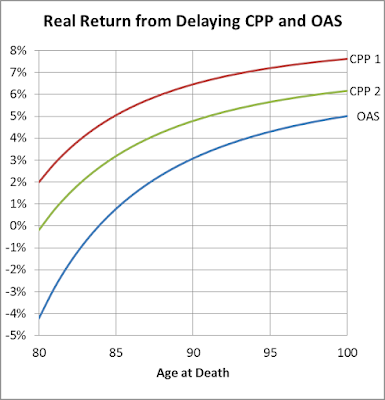 A chart below (after the discussion of CPP) shows the rate of return Carol gets depending on her age of death. A complicating factor is income taxes. If your income is high enough, some or all of OAS payments get clawed back. People with high enough incomes that they are subject to a clawback require a more complex analysis. However, the more income you have, the less important the relatively small OAS payments are to you. For our purposes here, I assume that you will not be subject to any clawing back. Another complicating factor for low-income people is the Guaranteed Income Supplement (GIS). My analyses here don’t apply to someone whose income is low enough to collect the GIS. The CPP case is similar to OAS, but with more complications. The default age to take CPP payments is 65, but you’re allowed to start taking payments at age 60. The price is a 0.6% reduction for each month you start early. This means that you get 64 cents on the dollar if you start at 60. You can delay taking CPP past age 65 as well. For each month you delay from 65 to 70, your payments increase by 0.7%. So, you get 142 cents on the dollar if you wait until age 70. (In reality, the increase is likely to be a little more than this because before you take CPP, it rises with general wages rather than inflation.) Similar to OAS, all these amounts are indexed to inflation. If you start early, you never catch up. The boost in monthly payments from delaying the start of CPP is permanent. CPP Scenario 1: You worked steadily enough from age 18 to 60 that you get no advantage from any dropouts (except the special dropout for the years from 65 to 70), and you can drop out all the years from age 60 to 70 that you don’t work. CPP Scenario 2: You had 7 or more years with no income from age 18 to 60 and you didn’t work past age 60. You couldn’t use any of the other special dropout rules, such as looking after children under 7. 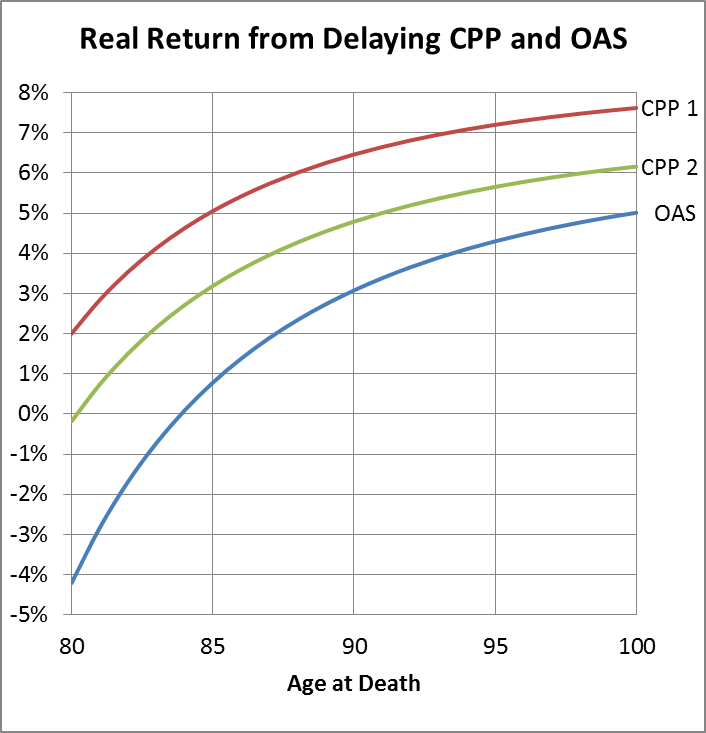 The following chart shows the real return (the return after subtracting inflation) from delaying CPP from age 60 to 70 depending on your age at death. It also shows the real return of delaying OAS from age 65 to 70. CPP scenario 1 is close to a best-case for delaying payments. It can get a little better if you work past 65 and use those years to replace some lower-income years. CPP scenario 2 is close to a worst case. It can be made worse if some of the special dropouts are relevant to you, but most people fall somewhere between these two scenarios. To understand this chart, it’s important to have a sense of what levels of real returns are high and low. Historically, 5% or 6% was what a diversified 100% stock portfolio with no costs received. More realistically from today’s high stock and bond valuations, even a 4% real return is high for a disciplined do-it-yourself investor who incurs very low costs and is 100% invested in stocks. If there is a fixed-income component, this drops to 3%. Those who have a non-fiduciary financial advisor and pay mutual fund MERs might hope for 1% to 2%. Anyone whose accounts get churned will get less, whether this churning comes from impulsive client decisions or unethical advisor actions. Armed with this information, we see from the chart that delaying CPP and OAS doesn’t look good if you don’t make it to age 80. But they look very good at 90, and fantastic if you make it to 100. But we don’t know how long we’ll live. So, it seems we’re no closer to an answer. I focus on making it to 100 for the simple reason that I know I’ll have enough money if I die young. It’s the possibility of living long that limits my spending today. I have enough savings to fill the gap before I’m 70. In fact, having a definite age where significant new income arrives makes it easier to plan for a portion of my portfolio to last until I’m exactly 70. Guaranteed real returns over 5% look excellent to me, so I’ll be delaying CPP and OAS to age 70. I don’t want to work until I’m 70. Neither do I. I don’t even plan to work until I’m 60. You don’t have to start collecting CPP the day you stop working. As long as you have the savings to last until you’re 70, you can delay taking CPP and OAS. I want to spend some money while I’m young enough to enjoy it. Me too. In fact, delaying CPP and OAS helps me spend more money today. By making my future income more certain, I can safely spend more of my savings before I turn 70. Won’t a higher CPP payment mean I’d get a smaller CPP survivor pension? The total of your CPP payments and a survivor’s pension are subject to a maximum. However, the calculation makes adjustments to nullify the effects of taking CPP early or late. See Doug Runchey’s explanation of CPP survivor benefits for all the gory details. I read that taxes and the desire to leave an inheritance can affect this decision in many ways. That’s true. But it’s mostly true for the rich. Skilled financial planners mostly deal with wealthy people and write about their concerns. These are the people who are trying to figure out how they can spend $11,000 per month instead of just $10,000. People who have to get by on less have simpler choices to make. The thought of dying before age 70 and getting nothing for all my CPP pay deductions drives me insane. Try to focus on the fact that if you live long enough, the government will pay you more than they expected. Everyone in my family dies young. If you’re absolutely certain you won’t live to old age—so certain you have no intention of planning for it at all—then take CPP and OAS early. However, if you think living past 85 is a possibility, consider delaying CPP and OAS. We’re wired to make decisions that are good in the short term. Fortunately, a sequence of good short- to medium-term decisions usually leads to acceptable long-term results. However, CPP and OAS are cases where our tendency to take money now often doesn’t lead to the best long-term outcome. It’s certainly not the case that all people should delay CPP and OAS until they’re 70. However, many who take CPP and OAS as early as possible would be better off waiting for larger payments. Nicely done! Like you, we plan on delaying to age 70 as well as way to hedge the risks of inflation, longevity, and unfavorable markets. But we are most certainly in the minority as less than 2% of retirees delay to age 70...another puzzle. @Garth: Glad you like it. My guess is that the resolution of this puzzle comes down to "I'd like money now instead of later." @Daniel: There is a lot of complexity when factoring in taxes. The main consideration is avoiding OAS clawback. But, anyone facing clawback is wealthy enough that OAS payments are too small to be very important. Another nice article! If you are living primarily off your investments in retirement, the first 5-10 years of investment performance has a disproportionate effect on your retirement, so called sequence of returns risk. So I think comparing with stock or balanced portfolio returns is pretty risky. Better to compare with annuity costs, where $50000 gets a 70 year old a $272 a month not indexed to inflation at RBC for example. So if Alice took her OAS at 65 and saved up $50000 for an annuity at 70, she could get in the ballpark of Carol's income for life (lagging by inflation over the long term). If Alice saved her OAS payments and invested them safely, only matching inflation, she'd have $42000 by the time she was 70 so Carol is already ahead by $8000 by delaying OAS. The return on investment around 4-5% looking at it this way, not a certain return as annuity values could change, but probably a lot less volatile than stock or balanced portfolio returns. In any case, the conclusion is the same for me, unless you are really unlikely to live very long past 60 or 65, it's better to defer CPP and OAS. @Greg: I don't think it's fair to make the comparison based on buying an annuity at 70. If Alice has $42k at age 70 and hopes to use it to create income for the rest of her life, it's unlikely she'd be best off using it all for an annuity. However, we're in agreement on the final conclusion that it makes sense to defer CPP and OAS. @Michael, she may not be better off buying an annuity at 70 but I don't think it's fair to compare $252 per month for life backed by the Canadian government with the expected return of an investment portfolio. Guarantees are valuable. @Greg: In all my planning, I always back off from expected portfolio returns. For example, I use 4% real for stocks and 0% real for fixed income rather than the historical figures. Further, I build in plans to spend less if investments disappoint. Nice analysis and I generally agree. The only argument against that I didn't see listed is the potential for the government to change the rules at any point. It's sort of your bird in the hand argument....except there is real potential that the rules could change, so it's more than just erroneous economic decisions. Low probability, at least from what I can see today. But then a lot can change fast these days. Once you take the money, it’s yours. Put it into TFSA, invest and it will grow. If you wait, you might get a bit more from the government. So it says. So guaranteed. Because governments never change anything. @Anonymous and @BHCh: Governments changing rules is certainly a possibility. For example, they could introduce a 1% per year tax on TFSAs. Or they could introduce wealth taxes on all assets as advocated by Thomas Piketty. True enough. Would certainly do all I can to keep expropriations/commies out of government. If they get anywhere near government... We’ll be out of Canada. @Eric: Garth's numbers don't add up. Extremely few people will earn a high enough return on TFSA savings to match the higher CPP payments. His argument about getting pushed into higher tax brackets by RRSP withdrawals doesn't make sense either. The idea is that you draw on RRSPs before starting to take CPP. Then later RRSP withdrawals will be smaller but by less than CPP rises. Overall, people who have enough savings to make it to 65 or 70 are further ahead waiting. Also note that Garth Turner is a fee based financial advisor who charges a % of assets under management. His advice belies his true incentives. He does not want his clients spending down their savings early in their retirement.